Gatherer of the past, inspirer of the future, a colossus astride history and civilization, Johann Sebastian Bach personified and brought to a close the Baroque era of music. In his lifetime (1685-1750), his reputation was as a great organist: as a composer, his music was considered old-fashioned and overly embellished. Bach’s mastery of the older polyphonic style was in conflict with the younger generation’s preference for the newer homophonic style. When he died, his musical legacy of over one thousand compositions suffered neglect for almost a century. His "rediscovery" was one of the major turning points in music history. Filmed on the 250th anniversary of Bach’s death, this production guides the audience through the composer’s life. Selections from Bach’s orchestral and religious works are heard and excerpts from many of his masterpieces are performed on the harpsichord, clavichord and piano. 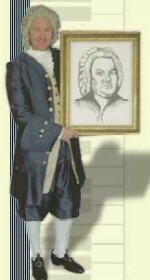 Bach’s compositions are universally recognized and cherished as among the most outstanding creations of his or any age. Discover the world of these brilliant musicians, what life was like, both personal and professionally. Now you can invite great composers into your classroom with this amazing set of videos. Actor Dennis Kobray portrays Bach, Mozart, Beethoven, Gershwin and a friend of Scott Joplin, "The King of Ragtime". SELECT AT LEAST ONE ITEM BY PUTTING A CHECK IN ONE OF THE BOXES BELOW. THAT WILL SHOW US WHAT YOU ARE ORDERING AND WILL ADD THE PRICE TO YOUR ORDER.